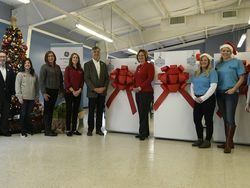 LOUISVILLE, Ky.—June 6, 2018—GE Appliances (GEA), a Haier company, announced today its goal to become the leading major appliance business in the U.S. The announcement was made on the two-year anniversary of GEA becoming part of the Haier Group, a global appliance company with the world’s largest appliance brand. “One of the most liberating things about being part of Haier is how they are helping us realize our potential and their desire to see GE Appliances grow. We’re free to reinvent our business to achieve growth and industry leadership. 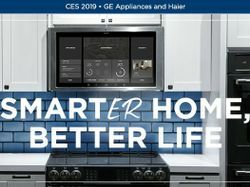 Our goal is to become the leading, most consumer-focused and contemporary appliance business in America,” said Kevin Nolan, president & chief executive officer for GE Appliances. “Haier encourages us to think differently about our future and how we serve our consumers and customers. We now think of ourselves as a two-year-old startup born of more than a century of industry expertise and backed by the world’s largest appliance brand,” Nolan said. Growing GEA’s Internet of Things or IoT leadership position, as Haier has done. GEA is investing in capabilities that will, for example, help owners personalize their appliances to serve their unique needs and create their home ecosystem. 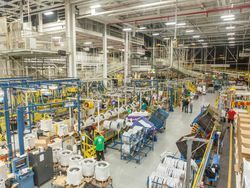 Investing in its nine U.S. production operations as part of its zero-distance-from-the-customer strategy of making products in the markets where they’re sold. For example, GEA is implementing Haier-developed software called Brilliant Factory that will enable its factories to have more usable data available on mobile devices and laptops than ever before. Real-time, data visualization tools are helping the business make better and faster production decisions because the data they need is at their fingertips. This is already improving overall equipment and production efficiency, improving product quality and reducing costs. Investments by GEA and its strategic partners to expand GEA’s extensive distribution network with new facilities in Dallas, Denver, Atlanta and Northern California, creating over 220 jobs in distribution, delivery and in-home installation. Becoming the leader in the U.S. requires GEA to be closer and more responsive to the consumer than any of its competitors. It has reorganized to achieve that, adopting Haier’s proven practice of creating independent business units that are grounded and guided by local markets and consumer connection. These business units, called “microenterprises,” are entrepreneurial enterprises that are fast and nimble, making decisions once residing solely with the CEO and other senior executives.This strategy allows the microenterprises to quickly pivot to modify their approach and seize new opportunities to create value for consumers. The business’ transformation extends to GEA’s approach to the market with the guiding principle, “Owner is Boss.” GEA has conducted intensive research and evaluation over the past two years to know all segments of the appliance-buying public better than anyone. That has driven a major change with GEA moving from a branded house to a House of Brands strategy with new, distinct branding and go-to-market strategies for each brand that match what each owner segment wants; Hotpoint®, GE®, Haier®, GE Profile™, GE Café™ and Monogram®.